Russia’s innovation city Skolkovo: Plagued by doubts, but it continues to grow. Skolkovo is Russia’s bid to jump-start its tech industry. Can it overcome the corruption charges and political conflict swirling around it? The Hypercube, the first building of Russia’s Skolkovo Innovation Center, in September 2012. The view from the roof of the seven-story, mesh- and LED-covered Hypercube building is one of modern-day Russia, where just 110 billionaires control 35 percent of the household wealth. Immediately to the south is a golf course built by President Vladimir Putin’s “favorite oligarch,” Roman Abramovich (net worth $10.2 billion), who reportedly owns a residence in the neighboring village along with Suleiman Kerimov (net worth $7.1 billion) and Brooklyn Nets owner Mikhail Prokhorov (net worth $13 billion). 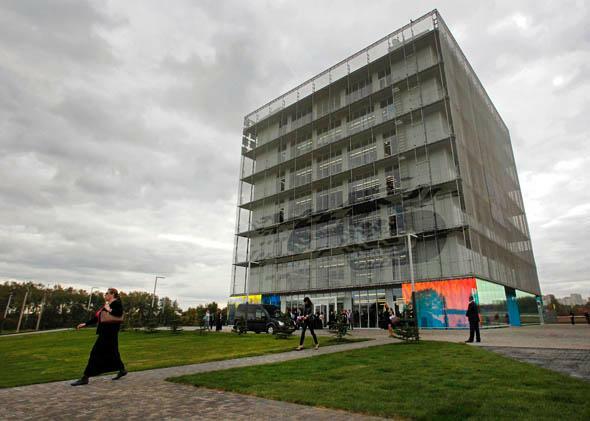 The Hypercube is the first building of the Skolkovo “innovation city” at the edge of Moscow. While the Kremlin-connected billionaires next door all made fortunes off Russia’s natural resources, the implicit goal of the Skolkovo innovation hub is to move the country’s economy away from oil and oligarchs by jump-starting the tech startup industry. Allegations of corruption, construction delays, and political conflicts have plagued the project, but it has nevertheless continued to amass resident companies and further investment. But the jury is out on whether Skolkovo will be able to stimulate Russia’s entrepreneurial environment—and justify an estimated $5.4 billion in government spending. From the start, Skolkovo was trumpeted as Russia’s answer to Silicon Valley. Soon after he started the project on New Year’s Eve 2009, then-President Dmitry Medvedev jetted off to the actual Silicon Valley to schmooze with Steve Jobs and Arnold Schwarzenegger, then governor of California. Medvedev also visited Cisco, which signed an agreement to invest $100 million of venture capital in Skolkovo. IBM, Intel, Microsoft, Nokia Siemens Networks, and others later signed agreements, too, while MIT signed up to advise on the creation of the Skolkovo Institute of Science and Technology (Skoltech). In some ways, Skolkovo is eerily reminiscent of Soviet utopian city-building projects. Plans for the 1,000-acre site include a technopark; a cultural center; research clusters for five strategic industries (IT, biomedical, energy, nuclear, space and telecommunications); 50 research and development centers; a hospital; a school; and apartments, townhouses, and offices where an estimated 30,000 people will live and work. Besides the Hypercube, only the foundations of the technopark building and the carcass of the Matryoshka office building—which will feature an eight-story atrium in the shape of a Russian nesting doll—have been built so far. Already, though, the 1,000-plus Skolkovo resident companies don’t have to pay any income tax, value-added tax, or property tax for 10 years, as long as they remain under certain limits on revenues and profits. Skolkovo has in the past seemed like a typical pet project of Medvedev’s: reform-minded, jumped up on economic modernization rhetoric, but producing little in the way of actual results. After Medvedev exited the presidency for the premiership—trading places with Putin a second time—the future of Skolkovo was cast into doubt. Putin, who shares none of Medvedev’s love for tech gadgets and innovation talk, overturned his predecessor’s order for state companies to contribute $910 million to Skoltech, vetoed a law exempting Skolkovo from obtaining state planning permits, and nixed Medvedev’s plan to host the Group of Eight summit there in 2014. 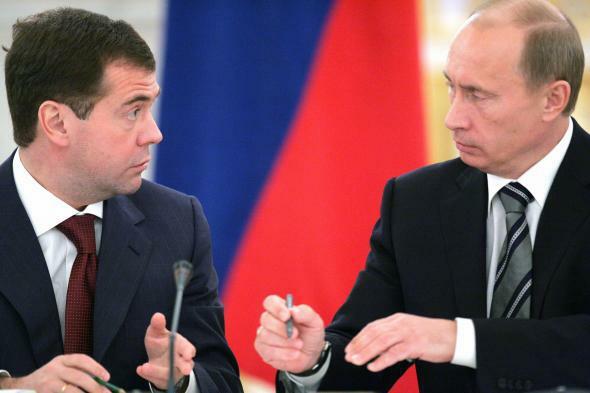 Russian President Vladimir Putin (right) speaks with First Deputy Prime Minister Dmitry Medvedev (left) at a session of the Council for National Projects in Moscow’s Kremlin in 2007. Deputy Prime Minister Vladislav Surkov—Skolkovo’s unofficial curator and the former “gray cardinal” behind the Kremlin’s ideological strategy—resigned abruptly after publicly criticizing the investigation into the project. Many saw his apparent ouster as confirmation that the investigation was related to a political attack on Medvedev’s faction by rival elites. But now it appears many of the accusations against Skolkovo were overblown. In August, the embezzlement case against the two managers was closed (one was charged with the less serious offense of abuse of authority). A court ruled that Ponomaryov received only $300,000 from Skolkovo. And in November, the prosecutor general announced that Skolkovo Foundation had addressed the violations it found and withdrew its accusations. “Skolkovo is one of the unfortunately few government projects that are in fact very clean in terms of corruption,” Ponomaryov said. Although the next seven years of Skolkovo’s existence have now been underwritten, it’s debatable whether the project will be able to stimulate Russia’s tech startup industry and justify a new infusion of $3.8 billion in government money. Recent legislation has only increased the tax burden on small businesses, which Russian entrepreneurs often cite, along with kickbacks, as the main obstacle they face. Eduard Kanalosh, chief investment officer of the Skolkovo Foundation, said Skolkovo is “speeding up” the formation of the tech sphere and venture market. But according to entrepreneur and blogger Anton Nossik, the government’s approach of handing out tax-exempt money to selected startups is “very wrong.” “Rather than a serious institutional approach, such as passing laws that would give businesses the incentive to innovate, you’re just gambling that some participants in your project will succeed,” he said. Boris Kagarlitsky, director of the Institute of Globalization Studies and a leading left-wing activist, said the government is “throwing money away” on companies that would be pursuing innovative projects even without the benefits. He noted that the government’s funding of Skolkovo comes at the same time that the Russian Academy of Sciences has been losing assets and funding. “Its first purpose is as a PR project, and the second purpose is that it’s specially thought up to bleed Russian science, take money out of it, and siphon it off to Skolkovo clients,” Kagarlitsky said. For now, Skolkovo continues to grow, with more than 1,000 resident companies. One of them is Aerob, which produces surveillance drones and has been contracted to work on projects for customers including the Defense Ministry. General director Andrei Mamontov said legal investigations won’t derail resident companies’ work and will only strengthen spending oversight at Skolkovo.